Braciolini di pesce are easily picked up with fingers and are ideal for the festive season when guests are standing around with drinks in their hands. These make wonderful little morsels on an antipasto platter. 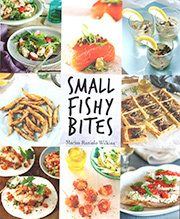 Because they are small bracioIe and the stuffing is light – only herbs and garlic are used –fillets of small fish (with skin on) are suitable: anything from mild-flavoured whiting, stronger tasting flathead or gunard to even stronger oilier fish such as mullet or sardines. 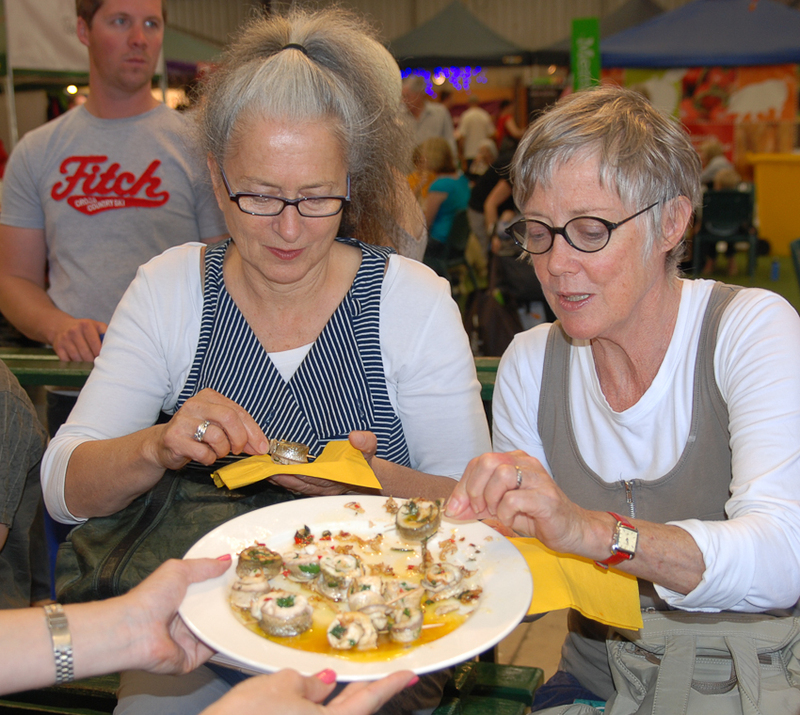 Adelaide Showground Farmers Market is for shoppers who enjoy fresh, seasonal and regional food. It is open each Sunday from 9am-1pm.The Adelaide Showground Farmers Market also has Demo Kitchen which offers chef demonstrations and tastings of produce and wine and on Sunday Nov 27th 2011, I was able to discuss Sicilian Seafood Cooking with RozTaylor who is the Demo Kitchen Host. Roz prepared a simple recipe from the book while I talked about some of the fresh market produce that was used in the kitchen demonstration. 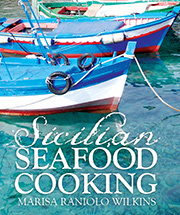 I also discussed some of the recipes in Sicilian Seafood Cooking and interacted with the audience. We used fillets of Coorong mullet from Coorong Wild Seafood (Trevor Bowden). He and his wife have a stall at the ASFM. Flatten each fillet; if using steaks, cut into small pieces. 1 slice per roll in the herb stuffing. Secure each roll with a toothpick. Saute in extra virgin olive oil. Add seasoning and (if you wish) herbs (rosemary, bay, oregano) or whole garlic cloves or 1 finely sliced onion. A few minutes before the end of cooking, add about ½ cup white wine and reduce. Remove herbs and garlic and serve. I also took the opportunity to discuss some of the vegetable produce from Patlin Gardens (Pat D’Onofrio). HIs stall is laden with a large variety of Italian vegetables. On that particular day, Pat had puntarelle, chicory, green radicchio (called biondo) and endives- all wonderful produce where the soft centre leaves can be separated to be used in a green salad and the coarse leaves can be braised. He also had fennel bulbs complete with long stalks of fronds- the fronds are excellent for flavouring and are a substitute for wild fennel which is used extensively in Sicilian cooking.